Leiticia Pestova is an fire flow artist, classical musician, and Celebrity Athlete Physiologist. She started playing classical piano and violin at age 3, and then began competing professionally in the Music in the Mountains Scholarship Competition at age 12: placing 6 years in a row. At age 10, she found a love for mixed martial arts, sword fighting and fencing, as well as acting, appearing in the TV series, "The Adventures of Master Luke" in 1992. Leiticia began professional fire breathing in 2016. In 1999, she started fighting in women's mma, winning her first 11 amateur fights and then getting her first pro-bought against Muay Thai champion Gina Carano in Las Vegas. When she was not fighting, she was touring with her classical-crossover band CJA and has performed on America's Got Talent, ESPN Monster Trucks, NCAA Men's Basketball, Coors Lightworld Finals, and The Next Great American Band. She currently has three albums out with her band and also has written several music books for the intermediate pianist. Charity is a huge part of Leiticia's daily life and she has worked with countless organizations including Sunshine Acres, Alice Cooper's Solid Rock, Young Ones United, Debbie Gaby Foundation, Rotten Rottie Rescue, and Phoenix Children's Hospital. She has starred in "Undefeated" and also "The Shadowrealm." 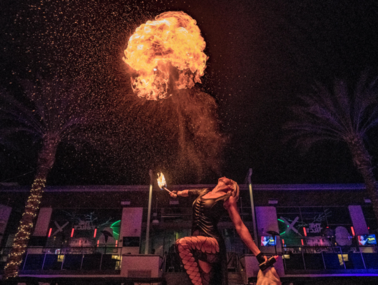 Leiticia has been touring with her fire troupe, The Ministry of Fire throughout Las Vegas, CA, and Arizona. You can add her on Instagram @Fire_Breathing_Barbie for up to date show info. She currently works with celebrity clientele who are training for athletic competitions, and the Olympics.